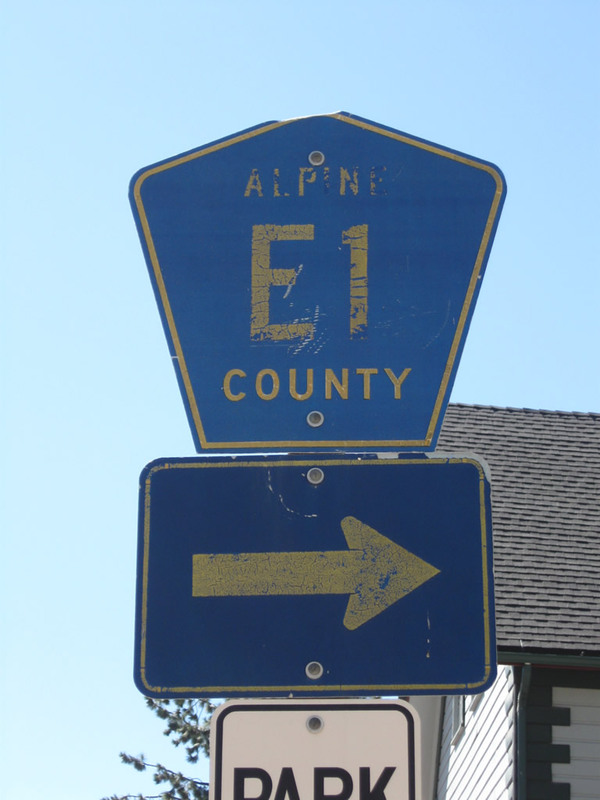 The lone marker for Alpine County E-1 appears at the intersection of SR 4 & 89 and Montgomery Street in Markleeville. Photo taken 07/25/09. Alpine County E-1 spurs 3.6 miles west from California 4 & 89 in Markleeville to Grover Hot Springs State Park. Alpine County E-1 follows Montgomery Street west from California 4 & 89 through Markleeville, then splits onto Hot Springs Road the rest of the way to Grover Hot Springs State Park. Photo taken 07/25/09. County Road E-1 shifts onto Hot Springs Road from Montgomery Street. Laramie Street ties into the wye intersection from the south. Grover Hot Springs State Park lies four miles to the west. Photo taken 07/25/09. Leaving Markleeville, Alpine County E-1 follows Markleeville Creek into Humboldt-Toiyabe National Forest. This county roads serves several rural homes and ultimately ends at the entrance to the state park. Photos taken 07/25/09. Alpine County E-1 comes to its western end at the entrance to Grover Hot Springs State Park. Photos taken 07/25/09. Activities at the Grover Hot Springs State Park include hiking, swimming, camping, and fishing. Photos taken 07/25/09. CR E-1 spurs west from SR 4/89 to Grover Hot Springs State Park in Alpine County, California.